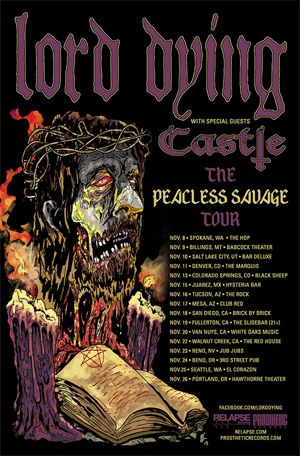 Portland, Oregon's LORD DYING have completed recording their sophomore album and are set to embark on a West Coast tour with stoner/sludge trio CASTLE. The new record, entitled Poisoned Altars, was recorded with TOXIC HOLOCAUST's Joel Grind (BLACK TUSK) at Audiosiege Studios in Portland and will see an early 2015 release via Relapse Records. "We are excited to get out on the road and pummel you with endless riffs! This time we will be joined with San Francisco's CASTLE. This will be heavy as hell, don't snooze and loose!" More details on Poisoned Altars, including cover art, tracklisting and a release date will be announced shortly.